If you've never heard of Ginch Gonch underwear, you're probably the type that wears plain, boring whities. Ginch Gonch designs are great and with names like “Shiny Heiny”, “Wiener Eater” and “Crotch Rocket”, how can anyone resist? 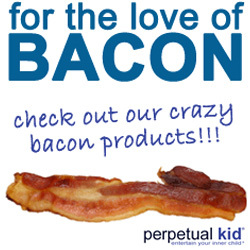 Well, they aren't sleeping on the bacon trend and have just released the I LOVE BACON line. 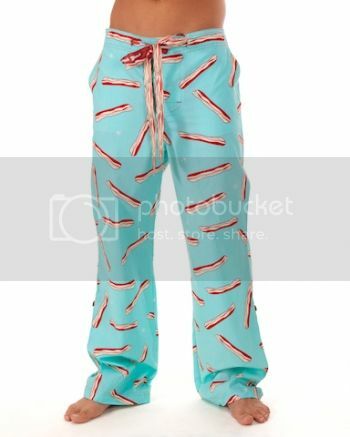 The ads are funny as hell and I'm dying for the bacon lounge pants. I only wish they made them in more sizes. Amazon has a few of the styles, the rest are on the Ginch Gonch website. 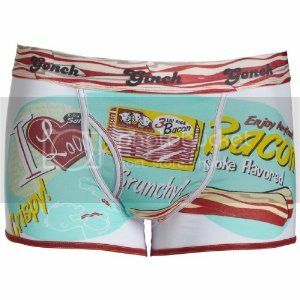 I LOVE BACON underwear for men and women have a nifty retro look and a unique, cripsy-strip waistband with an anti-muffin top elastic so you can stuff yourself with fried pork fat to your hearts desire without looking bad in your underwear. How awesome is the bacon cord on those pants? Those jammie pants are ADORABLE!